PLEASE REGISTER YOUR CARD TODAY! If you already have an online account sign in and click on view your rewards details.Scroll down to the bottom to Community Rewards and add Wayne Local Schools to your account. Our School number is 82139. If you do not have an online account - SIGN UP TODAY. Just follow the steps to register your Kroger Plus Card. 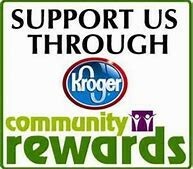 You must swipe your registered Kroger Plus card or use the phone number that is related to the registered Kroger Plus card when shopping for each purchase to count.